The exhibition grounds of Paris Nord Villepinte are in the outskirt Parisian town of Villepinte, very close to the Roissy-Charles de Gaulles Airport. 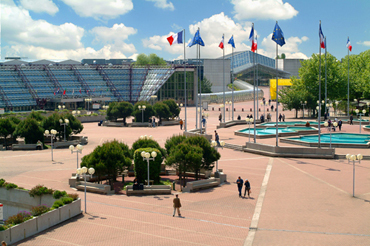 It was opened in 1982 and is the second largest exhibition centre in France, complete with 8 different exhibition halls and 44 conference rooms. Throughout the year, around 2 million visitors flock to the exhibition halls, where a great variety of trade fairs are held, such as the International Food Exhibition SIAL, the International Exhibition for Interior Decoration, more decorations and design at Maison & Objet or the International Trade Fair for Building Industry BATIMAT. If you are planning to visit one of these impressive trade fairs, ParkingsdeParis.com recommends parking in a cheap and secure car park close to the Parc des Exspositions de Villepinte. However, the act of finding a parking space around the grounds is rarely an easy task, due to the flood of visitors that pour towards the grounds. Evidence of this starts before you get there and you could find yourself trapped in one of those pesky traffic jams that do all they can to plague our lives. ParkingsdeParis recommends a better alternative: follow the Park & ​​Ride principle. It’s simple. Park your car in a secure and reasonably priced car park near an RER station with access to line B. Hop on the train at one of these and you will be there in no time! The RER B line runs from Charles de Gaulle Airport to the city centre, via the Villepinte (Ast B3), Parc des Expositions (Ast B3) and Le Vert-Galant (Ast B5) stations. If you want to spend several days in Paris and discover other corners of the capital, that’s no problem, thanks to the light traffic between the car parks and the RER line B. So, you can enjoy the whole city in total relaxation mode, without the hassle of waiting in traffic jams and the stress of parking in the city centre.